The centerpiece of Peer Instruction is the ConcepTest, sometimes referred to as a clicker question, other times simply as a question. ConcepTests, however, are more than mere questions. They are the fire, so to speak, that draws students’ attention and calls the students together to engage in the social learning activities that make Peer Instruction work. In the past, ConcepTests were written as multiple-choice questions — and if you do any additional reading about them you will see others have defined them as such. This definition resulted primarily because of the limitations of technology to help instructors poll anything but multiple choice. Today,with cutting edge classroom response systems there are a range of rich-response types. For example, in the ConcepTest in Figure 1 below, I used Learning Catalytics to ask my audience to identify the region of the brain responsible for vision by tapping on their screens (they were using smart phones and Tablets). You can see the blank question and the results after Round 1 of voting. The green dots represent the individuals selecting the correct region. Figure 1. Instructor view of region ConcepTest on Learning Catalytics. Brain image from ROOTs project. Another cool thing about ConcepTests is that they turn the Peer Instruction classroom into what I like to call a higher-order thinking sandbox, where students can, in a low-stakes environment, build expert-level cognitive skills that are conduits to the Holy Grail of learning – knowledge transfer (the ability to apply prior knowledge to solve problems in or navigate new, unfamiliar contexts). Some of these expert-level cognitive tasks include the metacognitive activity of self-monitoring. When we ask students to respond to ConcepTests, we are asking them to think about what they know and what they don’t know. It is only when students gain awareness of their knowledge through self-monitoring, that they can further engage in the kinds of activities that are the mark of the most expert learners, such as self-regulation (e.g. controlling and assessing your own learning and related learning behaviors). Finally, ConcepTests gives students extensive practice with retrieval. As research from the folks at the Memory Lab at Washington University in St. Louis emphasize, when students are asked to retrieve information, it increases their knowledge retention. This is the brain on Peer Instruction. Great source of information! Thanks Julie! 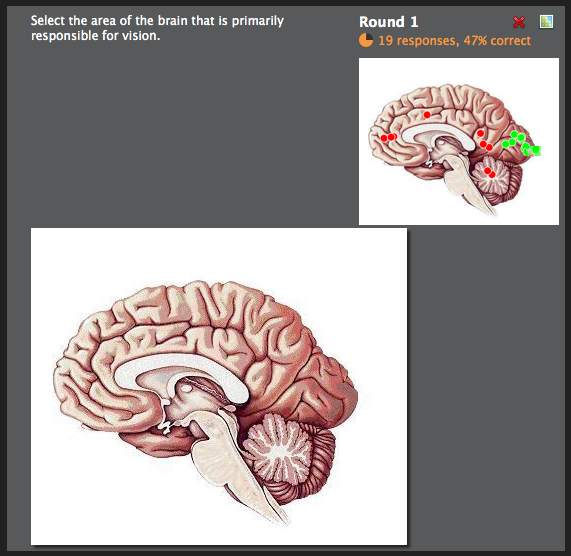 really like the use of the questions with brain diagrams featured here. Still, I’ll be glad when the era of clickers passes and we are able to start using smartphones that serve multiple uses, are kept longer and thus are a bit easier on the environment than an additional accessory that borders on a throw-away implement. A brief rant follows based on ethics. Much being claimed as “peer instruction” was actually pulled together into a coherent approach to interactive teaching by the Johnson Brothers under “cooperative learning” over four decades ago and later brought into higher education in their book with engineering professor Karl Smith, Cooperative Learning in the College Classroom. Think-pair-share and write-pair-share are among their oldest and simplest techniques. A little giving credit where credit is due by the peer instruction folks would be a good example to set for our students. I urge users to check out where these ideas actually came from and giving due credit. One good source is Barbara Millis’ book, Cooperative Learning for Higher Education faculty with Phillip Cottell. One thing I admire about that particular book was the painstaking effort to trace origins of the techniques to their creators and give credit. Their book is hard to get copies of now though. Thanks for the comment, DD. We completely agree about having systems that take advantage of multiple device types! The above ConcepTest was indeed developed for and responded to using personal devices (laptops, ipads, phones, etc). Students tapped on the screen to identify the correct part of the brain. Also, great comment about the lineage of student-centered, interactive learning. There are so many incredible advances in education that have been aiming toward the same end, to help students learn better with the acknowledgment that the best learning happens through dialogue (Ala Socrates). Some other early folks to add to your important list include Langdell who sparked the last real massive reform in higher education with his introduction of the casebook method in law schools in the 1800s. He required students to prepare by reading cases before class and focused in-class time testing students’ understanding using the Socratic method versus lecture. John Dewey was on a student-centered learning soapbox in the 1800s and early 1900s. And of course Lyman (1981) and think-pair-share (TPS). PI is related to but also distinct from TPS in a number of ways– one key difference is the centerpiece feature of PI being the ConcepTest. TTYN readers, any other key players? Perhaps a great future post would be a timeline with key players such as these and others. Thanks, DD! Does Peer Instruction Work in High Schools? – Turn to Your Neighbor: The Official Peer Instruction Blog linked to this post. I ditched my hardware based clickers a few years ago for formative assessment and started using Ubiquitous Presenter software for Concep Test like questions in class. The software and servers are supported by UCSD, and it’s free for faculty and students. Up.ucsd.edu is the address if anyone is interested. I’ll be giving a workshop on its use at the New England Faculty Development Conference (www.nefdc.org) June 8th if anyone is in the area and would like to try it out themselves.